On Wednesday, Liberal Leader Michael Ignatieff told The Canadian Press that he believes RIM should be able to sit down and negotiate with Nortel. "I don’t think they’re seeking an unfair advantage," he said. Nortel had been in discussions with RIM regarding a related transaction but those discussions are currently on hold. Since the approval of the bidding procedures, Nortel has engaged with a number of potential bidders regarding the CDMA and LTE assets, including RIM. Other parties moved expeditiously to comply with the court approved procedures to become qualified bidders, and RIM did not object to the approval of these procedures during the court process. It was not until July 15 that RIM submitted a letter to Nortel asking to be a qualified bidder and, since that time, Nortel has diligently attempted to work with RIM on acceptable confidentiality terms relating to Nortel’s valuable intellectual property assets. RIM has refused, however, to comply with the court approved procedures. On Tuesday afternoon, RIM said the deadline was irrelevant. So, ignoring deadlines set by the court, refusing to comply with court approved procedures, starting a war by media a couple of days before the auction closes, and involving the government by invoking trumped up "national security" charges and concern about lost Canadian investment. This from a company that didn’t seem that concerned about repaying a $38 million loan [PDF] from Technology Partnerships Canada. I wonder what would constitute "unfair advantage" for Mr. Ignatieff? That appointment is for next year. Apparently my wife’s first appointment with an orthopedic specialist is in 2010, actually TWO YEARS AND FOUR DAYS after her accident. Right now the staff are booking for December 2010. This specialist covers from London to Toronto, and from Hamilton to Owen Sound, an area with probably close to a million residents. He is in town one day a week and sees 10 patients in that day. So kick back, relax, and do check in with us at the same time next year and see what happens. Shouldn’t getting it right be a little more important than getting it done? President Obama hailed the Senate health committee’s action, but reiterated his insistence that each chamber of Congress approve a health care bill before the August recess. His comments increased pressure on the chairman of the Finance Committee, Senator Max Baucus, Democrat of Montana, who has been struggling for months to get a bipartisan bill. Will this be another bill that lawmakers fail to read before voting for it? Why the rush? Privacy commissioner Jennifer Stoddart said the social network violates federal law by storing the personal information of its 250 million global users indefinitely, even after users deactivate their accounts, and that the privacy information contained on the site is often confusing or incomplete. I won’t argue the point; it sounds completely accurate. However, I wonder if Facebook is being held to a higher standard merely because it is a popular high-profile target. If I had an account at Sears or The Bay and cancelled it, do I believe for a second that they have purged their files of all of my personal information? Is the privacy commissioner investigating those companies? What about banks? Facebook only has whatever information I choose to give it. Sears, The Bay, or banks compel me to provide personal information, including financial data. I’m far more concerned about who controls that information which I was forced to give, than that which I ostensibly chose to give. In this era of increased information sharing, the concept of privacy is much more fluid. I find it more important to be told specifically what information these companies hold, who they consider to be the owners of the information, what they plan to do with it, and how I can get them to remove it. And I am far more concerned about the information I am forced to give both commmercial and governmententities than that which I choose to give to a social network. Today is the one year anniversary of my wife’s car accident. She was hit by somebody who went through a red light, rolled her SUV four times, and ended up on her roof. She has been in constant pain ever since, even though our insurance company, State Farm, has declared her all better and stopped paying for treatment. So in Canada’s free healthcare system, we’re still out of pocket for several hundred dollars of physiotherapy. And to top it all off, on Monday, one year and four days after the accident, she finally has her first appointment with an orthopedic specialist. She also has a doppler test scheduled. Over a year later. And if she needs treatment, who knows how long that will take. It didn’t take long to run into an "uh-oh" moment when reading the House’s "health care for all Americans" bill. Right there on Page 16 is a provision making individual private medical insurance illegal. And you should probably read the bill, because your elected politicians sure aren’t. You’ve probably heard that there is no such thing as a free lunch.Or free healthcare. Workers at the French arm of telecommunications manufacturer Nortel (NT.TO) have forced management into talks over layoff terms by threatening to blow up their factory, local authorities said on Wednesday. Workers had placed gas cylinders that turned out to be empty in front of the plant in the Yvelines area near Paris after provisional management cancelled a planned meeting on Monday. A total of 480 jobs are set to be axed at the plant following bankruptcy proceedings. Given the way in which Nortel declared bankruptcy and dumped Canadian workers with no severance, while taking millions in management retention bonuses, this may be the only way to get their attention. Now that isn’t exactly the kind of welcome you want to give to prospective applicants. 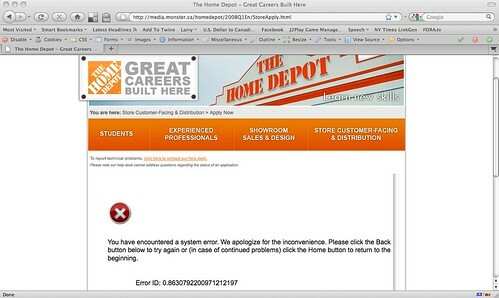 And to be fair, it appeared that Home Depot was actually using brassring.com for its online job site. But I felt that they might want to know about the problem so I reported it to their helpdesk. Now browser support is always an issue, but you’ll probably note that several of these options (especially on the Mac) are probably no longer in use. And the helpdesk was very understanding and apologetic, explaining that the site was in the process of being updated. 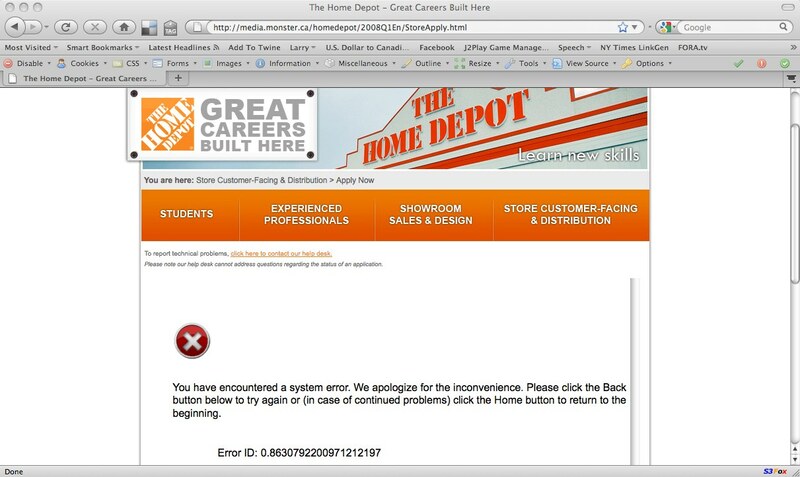 It is important though for companies such as Home Depot that for many people this may be their first encounter with the company, and it would be a poor one. It would likely leave a lasting impression about how the company treats people, even though that clearly isn’t their intention. This kind of situation is one in which hiring companies should forego glitz and glamour on the site in favor of a much more simplified site that is guaranteed to work in every browser, for every user. If the hook the applicant initially they’ll have plenty of time to dazzle them later. But losing them at the first screen is analogous to a customer abandoning an online shopping cart. Given a little effort, that doesn’t have to be the case. I recently finished my latest iPhone application and it’s up on the App Store now. 4Degrees – The Arc of Trivia (iTunes App Store link) is a multi-player trivia game for up to six players, with plenty of graphics, animation, sound, and some pretty tough questions. A scoreboard display at the end of each question as well as other feedback lets you see how you are doing compared to the other players as the game progresses. In addition to the application which is written in Objective-C for the iPhone, I also developed a content management system written in PHP which runs on Amazon EC2, with object storage in Amazon’s S3 storage cloud, as well as a multi-player game server backend in Java. The multi-player server provides for game synchronization across all of the phones playing, using J2Play multi-player gaming technology. If there are less than 6 players available for a game then AI players will fill the other available slots. The application also provides in-game chat for players to talk to each other. The game was written for a company in Mississauga, Canada. If you are looking for contract iPhone application development, regardless of complexity, contact me via email at larry@larryborsato,com, or by phone at 519-572-4435. I was amazed to read this article in the Denver Post – Debunking Canadian health care myths. The author claims to have lived in Canada 17 years ago, but clearly has no idea of the current situation. I’ve lived in both the United States and Canada in the last 10 years and I can state clearly that she doesn’t know what she’s talking about. Overall, Canada’s taxes are slightly higher than those in the U.S. However, Canadians are afforded many benefits for their tax dollars, even beyond health care (e.g., tax credits, family allowance, cheaper higher education), so the end result is a wash. At the end of the day, the average after-tax income of Canadian workers is equal to about 82 percent of their gross pay. In the U.S., that average is 81.9 percent. Actually, the after-tax income of Canadian workers is a little closer to about 52% of their gross pay, including our new healthcare tax in Ontario, and US workers are often paid more for the same job. When I moved to the US, I had my HR department calculate my take-home pay three times because I didn’t believe it could be so high. More than 31 percent of every dollar spent on health care in the U.S. goes to paperwork, overhead, CEO salaries, profits, etc. The provincial single-payer system in Canada operates with just a 1 percent overhead. 1% overhead huh? Actually it’s closer to 17%. I currently live in Waterloo, Canada, where we are paying a former hospital CEO two years severance (about $750,000) after he was let go for not doing his job, while we pay the current CEO a similar amount. We have local health network bureaucracies that tell the hospitals how they may spend their money. We block fund hospitals and don’t allow deficits, meaning that their goal is to limit serving patients rather than treat more so as to conserve money. And there is out and out bureaucratic waste. While HMOs and other private medical insurers in the U.S. do indeed make such decisions, the only people in Canada to do so are physicians. In Canada, the government has absolutely no say in who gets care or how they get it. Medical decisions are left entirely up to doctors, as they should be. Really? About two minutes of searching turned up this article. The provincial health bureaucracies control drugs as well as access to diagnostic equipment. There are no waits for urgent or primary care in Canada. There are reasonable waits for most specialists’ care, and much longer waits for elective surgery. If you are fortunate enough to have a family doctor, you will probably wait a week or two for an appointment. An ER visit will be a minimum 9 hour wait. My wife had a car accident a year ago and she is still waiting for an appointment with an orthopedic specialist. Wait times are a chronic problem. Most physicians in Canada are self-employed. They are not employees of the government nor are they accountable to the government. Doctors are accountable to their patients only. No they are not employees of the government. It isn’t clear who they are accountable to. The amount they bill to the government is capped, so there is now a multitude of administrative fees, such as $20 to renew a prescription, or $100 to have your medical records forwarded to another doctor. Oh that’s right, in Canada you do not own your medical records. A while ago a local clinic closed and patients were forced to pay hundreds of dollars to get access the their medical records. From a purely statistical standpoint, there are enough physicians in Canada to meet the health care needs of its people. But most doctors practice in large urban areas, leaving rural areas with bona fide shortages. That would be funny if it weren’t so sad. 16% of Canadians do not have a family doctor. We live in a community of 500,000, 45 minutes outside of Toronto – hardly rural – and we just got a doctor when an office opened up that was taking patients. Even then, the doctors won’t take patients who are too ill, and generally forbid you from visiting any other clinic while you are a patient. As a result of not having doctors, our emergency rooms are perenially overcrowded. She’s got me there, but that 10.6% only pays about 71% of the cost. And yes everyone is covered, but wait times to see specialists and for procedures can be extreme. There are substantial differences between the American and Canadian systems. Yes it would be ideal if everyone was covered, but not if it results in a slow bureaucratic system with underserviced areas and long wait times. A clear and rational analysis is necessary. But misinformation such as this article serves no one.